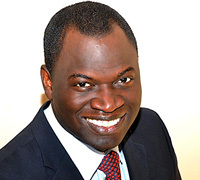 Pape Samb is a social entrepreneur specialized in international development. He has almost 20 years of experience in program and resource development, fundraising, partnership building, entrepreneurship, strategic planning, training and facilitation, global leadership, content management and public speaking. He is a passionate individual who focuses his energy on educating people about entrepreneurship and leadership and empowering women and youth around the world, helping them become self-sufficient and connecting them with resources to achieve their goals. President of Exeleadmen International Consulting, a firm, which focuses on providing leaders and entrepreneurs with the knowledge, tools and network to create economic value by way of creating societal value and enabling a strong entrepreneurship ecosystem for youth, women and underprivileged communities. Adjunct Professor of American University in Washington, DC at the rank of Executive in Residence in the Department of Public Administration and Policy in the School of Public Affairs. Chief Business Strategist at Outward Exports, where he provides investment opportunities in the areas of agriculture, transportation, energy, health, infrastructure / engineering to emerging markets. He is also involved in business related activities with the Clinton Global Initiative (CGI), helping to solve the worlds pressing challenges and creative positive change around the world. He recently developed for American University’s Key Executive Leadership Program the new and only Global Shared Value Leadership (GSVL) certificate program in the world. Global Shared Value Leadership (GSVL) brings together businesses, nonprofits, and governments to link company and community prosperity. He has also developed and implemented other programs in countries in Europe, Asia, and Latin America. As an advocate for youth initiatives, he frequently facilitates post-2015 thematic Youth Consultations for the United Nations on the MDGs ( Millennium Development Goals ). He also taught business management and analysis at the University of Potomac. Over the past 9 years, he has raised more than million for several organizations. He has travelled extensively and consulted in almost 100 countries, has spoken to hundred thousand people, and mentored and trained approximately 50,000 young women and men in leadership and entrepreneurship. He is an active public speaker on the national and international forefront and has spoken at high level conferences in Africa, Europe, Asia, and the Americas. He is also a well-known advocate for developing self-sustainable, community and youth-led initiatives, experimental innovation-based approaches, and new entrepreneurship and leadership training models. Prior to Exeleadmen, he rose from the ranks of director of programs and COO to become president and CEO of Phelps Stokes, America’s oldest continuously-operating foundation. As the youngest and first non-American to head the organization, he provided leadership and vision in globalization and investing in a new generation of global leaders. At 13 years old, he founded GRADES, a women’s empowerment and youth economic development organization in Senegal. He also founded in 2010 the Senegalese Next Generation of Leaders (SENEGEL) working to train and support a new generation of well-educated, competent, and ethical Senegalese leaders. Emerging Social Ventures and Entrepreneurs, Social Impact Investors, Capacity Development and Support Organizations, and System Developers and Funders. He is an active board member of several organizations. and several awards including Leadership in Excellence, Next Generation of Leaders, Great Heart, Self-Less Founder, Community Counterpart to name a few. He is fluent in English, French and Wolof, and conversational in Spanish and several West African languages.